Jicama is one of those odd vegetables that doesn’t get used very widely in North American cuisine. Jicama is a root vegetable from South America that can be used as a great low-carb alternative to starchy grains and vegetables like potatoes, especially if you are on a paleo diet, gluten free diet, or low glycemic diet. Most of the carbohydrates found in jicama are fiber, which is great for digestion. While jicama does not offer a huge array of vitamins and minerals, it does act as a prebiotic. Prebiotics serve as the “food” for probiotics, which are the good bacteria in our digestive tract that are needed to properly breakdown food and remove waste. This prebiotic comes from inulin, which is a partly indigestible starch found in some root vegetables. Inulin is also found in onion and garlic. Jicama can be cut into this strips and then roasted to make an alternative to white potato fries. Jicama can also be eaten raw and added to salads. This following recipe is a great way to serve it up! 1. Prepare all of the vegetables. 2. Blend all of the dressing ingredients together in the food processor until smooth and creamy. 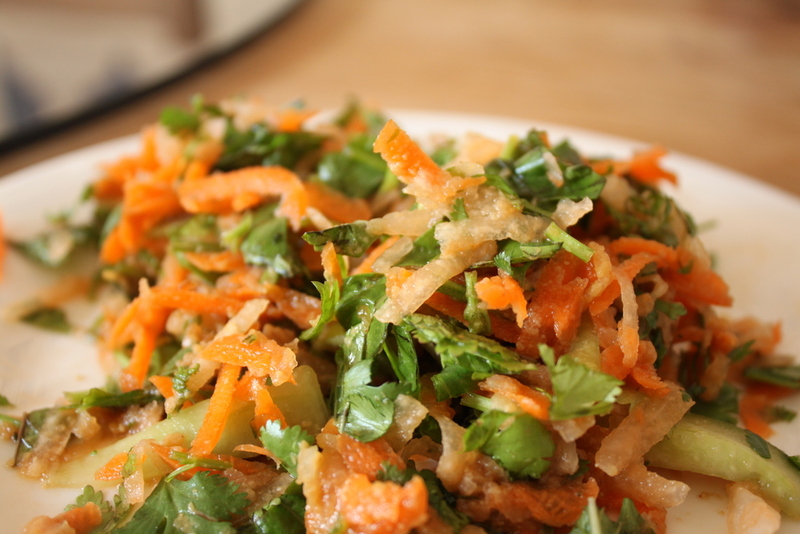 If you are making the dressing by hand, make sure to grate the ginger finely. 3. Toss together the vegetables and almond dressing.